Createad for those allergy and asthma sufferers who struggle to find relief. Excellent air filter for those with allergies, asthma, and for homes with smokers. The Allergy Machine features High Efficiency Gas Absorption, removing contaminants out of the air before they get a chance to irritate and trigger your asthmas or allergies. If the Allergy Machine doesn't change your life and improve your sleep, return it for a refund within 30 days. The Allergy Machine provides a comprehensive air cleaning solution, removing allergens, asthma irritants, sub-micron particles, chemicals and noxious gases. Every minute, The Allergy Machine draws over 250 cubic feet of air through a 4-stage HEGA filter containing Activated Military Carbon Cloth and over 60 square feet of True Medical Grade HEPA. 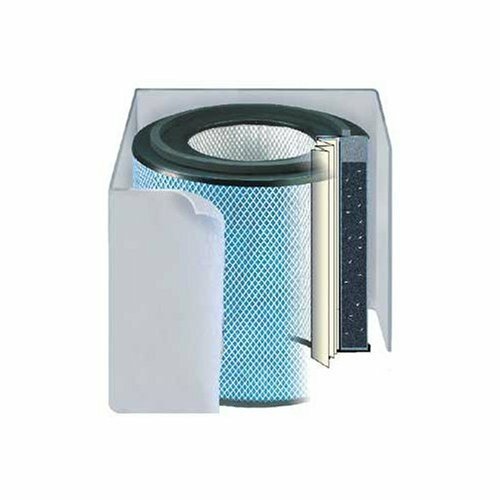 The 2 pre-filters help to make the more expensive main filters last longer. Comes with wheels for easy portability. The Austin Air Allergy Machine will clean up to 1500 square feet with normal ceiling heights. Solid steel construction, powder-coated paint, energy saving motor. Comes with a 30 day money back guarantee and a 5 year warranty on all parts and labor, as well as a 5 year pro-rated filter guarantee. Austin Air was chosen by the U.S. Government to fulfill the largest deployment of air cleaners in American history and chosen by FEMA and The Red Cross to address the serious air quality concerns in post 9/11 New York. Made in the USA. Filters mold spores, chemicals, pollen, dust mites, tobacco smoke, pet dander, bacteria & viruses. 30 Day Money Back Guarantee of Satisfaction! This is so good that a friend whose child suffers from severe asthma [and who has an Oreck air filter that cost about $800--- which broke down as soon as the warranty expired], could actually sense how much cleaner the air was when she was in the vicinity of the Austin and asked me where she could buy one. She asked even though I have had this for nearly 10 years [one filter change so far, by the calendar, not because I sensed it stop working]. I can't recommend it strongly enough. While it is a bit noisy, it's an even background noise, not at all irritating [and I am a real noise crank]; in fact when my neighbors have a party [their dining room wall is my bedroom wall], the hum actually is an added bonus and helps me to fall sleep. I live in an apartment and a few months ago I got new neighbors in the apartment below. They smoke constantly and often have parties with 8-10 people in a tiny apartment all smoking all night. The building is old, the smoke comes through not only the ventilation system, but directly through the floors and fills my apartment with the disgusting stench of Environmental Tobacco Smoke (ETS). This unit saved me from having to move. It's that good. The HEGA filter is particularly good at removing gas molecules and thus odors and ETS. I have allergies, but they're manageable - I bought this primarily for odor and ETS control and to that end, it works perfectly. It's much quieter than I though possible for something that moves so much air. Even on the highest setting, I can easily sleep in the same room with it. Some may be more sensitive to noise, but it's much quieter than some IQAir models that I've heard. On the lowest setting, it's barely audible. I keep the unit in a largish living room/dining room/kitchen area in my one bedroom apartment and it cleans the air effectively. When combined with the air circulation of my AC unit, it does a great job of filling the apartment with clean, smoke free air. The filters are extremely effective and come with a five-year warranty. If you live in a particularly polluted environment and your filter doesn't last five years, Austin Air will give you a discount on a replacement filter proportional to the length of its life. The bonus is, it's for that AND every subsequent filter you purchase. The unit itself also comes with a five-year warranty. Austin Air seems really great about craftsmanship and customer service. They don't make a huge variety of products (like Honeywell or a lot of other electronics manufacturers that offer air cleaners), but what they do, they do right. I've tried cheaper air cleaners and they just don't keep my allergies clear like my Austin Air. The Austin Air does not require costly (and often difficult to find) filter replacements. Instead, you just vacuum off the surface and the machine's good to go for a couple of weeks. Think of it this way, if there's dust on top, you want to wipe out the vents. We had one incident with a bearing problem in one of our machines and Austin Air replaced the machine under warranty with us only being out the cost of postage. They're great people to deal with--friendly, helpful, and they got my machine back FAST during cedar fever season. I have severe chemical sensitivities. I've tried almost every filter on the market that is supposed to take fragrances, etc. out of the air, but I've found none that lives up to their promises like the ones with the carbon filters by Austin. I have this in my home and it is certainly worth every penny I spent. Any perfumes or other fragrances that enter my home are taken care of pretty efficiently by this. For my 1100 sq. ft. home I keep this one in my bedroom and the Healthmate plus (also by Austin Air) in the living room and together they really keep the air clean. In fact, I usually cannot tell if there is a skunk nearby unless I open a door or a window...and my house is certainly not air tight. The main difference between this one and the Healthmate Plus is that the Healthmate Plus works the best on chemicals/fragrances in the air where this one is a good all purpose filter that also takes fragrances out of the air. This is why I keep it in my bedroom - I have a dust allergy and while the Healthmate Plus is certainly good at taking dust out of the air but we chose the Allergy Machine for my bedroom. There are three settings, low, medium and high. High is pretty loud, but not an irritating sound; low isn't too loud, but it is certainly not silent. You don't hear the motor, rather it is the airflow coming out that makes the sound. It is, what I consider, a gentle "white noise" sound. It has wheels (they don't lock) that move very well and I've never had one fall off. In fact, I find these machines very well made - not shabby - and I've had them for five years. They are made of metal and not plastic and I've never had to air one out. If you buy this for chemical sensitivities make sure it is the one with the carbon zeolite filter. If it is missing that one (and therefore about $100 cheaper) the other filters can become contaminated with fragrances and don't air out quickly. We accidentally didn't order the right filter the first time and found out the hard way; after days of airing one out outside with the filter running on full it didn't improve. We then ordered the carbon zeolite filter and were pleased that my husband didn't have a hard time taking this apart to replace the filter; it wasn't completely easy as the filter isn't really light, but it was certainly doable. One thing you should do is to vacuum the holes on the outside once in a while because they will start getting a little clogged up with dust after a couple years (or less if you don't vacuum or dust often). The filter is good for four years and if you contact the manufacturer before then needing a new one (we use ours ALL the time and so needed to replace ours after three) they will, as of a few months ago at least, prorate a replacement. Overall, I'm very pleased and would highly recommend this.